WASHINGTON, DC — A new study finds that the recent drought that began in 1998 in the eastern Mediterranean Levant region, which comprises Cyprus, Israel, Jordan, Lebanon, Palestine, Syria, and Turkey, is likely the worst drought of the past nine centuries. In addition to identifying the driest years, the science team discovered patterns in the geographic distribution of droughts that provides a “fingerprint” for identifying the underlying causes. 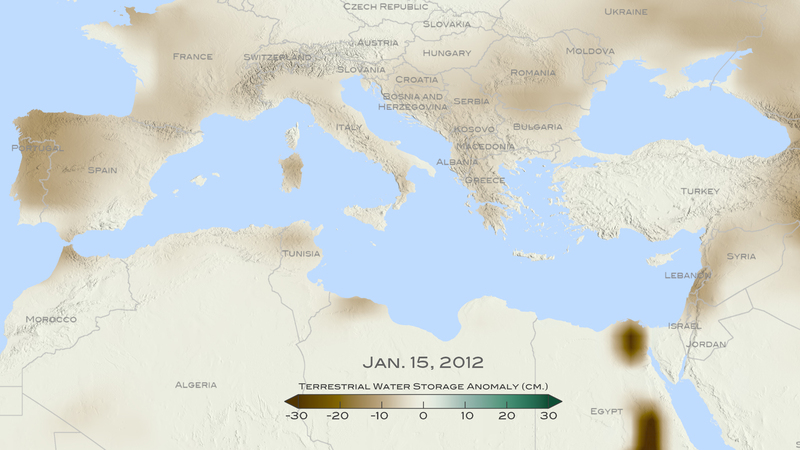 Together, these data show the range of natural variation in Mediterranean drought occurrence, which will allow scientists to differentiate droughts made worse by human-induced global warming. The research is part of NASA’s ongoing work to improve the computer models that simulate climate now and in the future. “The Mediterranean is one of the areas that is unanimously projected [in climate models] as going to dry in the future [due to man-made climate change],” said Yochanan Kushnir, a climate scientist at Lamont Doherty Earth Observatory, who was not involved in the research. “This paper shows that the behavior during this recent drought period is different than what we see in the rest of the record,” he said, which means that the Levant region may already be feeling the affects of human-induced warming of the planet. Cook, B. I., K. J. Anchukaitis, R. Touchan, D. M. Meko, and E. R. Cook (2016), Spatiotemporal drought variability in the Mediterranean over the last 900 years, J. Geophys. Res. Atmos., 121, 2060–2074, doi:10.1002/2015JD023929.